Lemo Drip is the first Rebuildable Drip Atomizer by Eleaf. This RDA is made of stainless steel, making it both durable and fashionable. 23mm, 510 thread and silver Color. Eleaf Lemo Drip RDA Atomizer, an innovatively designed atomizer, is the first Rebuildable Drip Atomizer (RDA) by Eleaf. Made by stainless steel, it has wide open space for ease of installing coil and cotton, large air inlet slots for huge vapor production, and the airflow can be adjusted to your preference as well. The wide mouthpiece is another plus to great vaping and nice flavor. First, pull up the tube with top cap, and fix the pre-made or self-built coil with cotton on the base. Note: make sure the finally fixed coils do not come into contact with the surface of the deck and inner wall of the tube. Then, drip a few drops of e-juice directly into the coil to make it fully saturated before use. Last, put the tube and top cap with mouthpiece on. 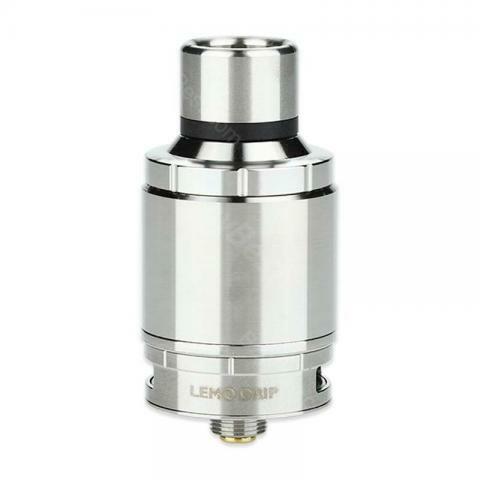 Eleaf Lemo Drip RDA is easy to use and build coils. Ich bin mit Eleaf Lemo Drip RDA voll und ganz zufrieden. Das Gerät lässt sich leicht bedienen und mit ein wenig rum experimentieren habe ich auch schnell die für mich pers?nlich idealen Einstellungen gefunden.